The UR350 Door frame is stable and secure thanks to the 1.2x0.8 in steel tubing and two expertly designed cross tubes. The secure threshold-less doors are especially made to allow access for handicapped individuals. 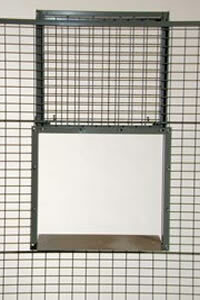 The mesh partitions are 2.0x2.0 in and are very strong; it is next to impossible to break into by hand. The doors are delivered assembled and are ready to be installed. The standard color is gray but other colors are available. If a moderate level of protections is desired the Troax Medium UX 450 mesh panel is recommended. 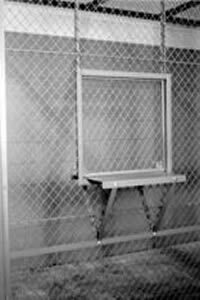 The Troax UX 450 can protect against break-ins because it has stable mesh partitions. The mesh is press welded 3x3.75 in wire and the tubing is 1.2x0.8 in. 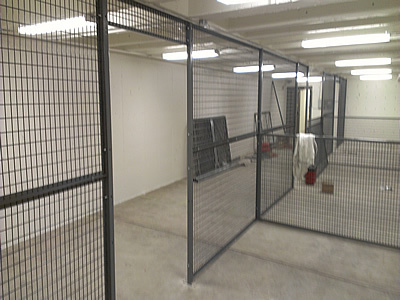 The mesh partitions are 2.0x2.0 in and are really strong; it is next to impossible to break into by hand. The effortless assembly of the UX 450 is customizable and can be made to fit any type of area. The Troax Medium can fit any ceiling height, it also fits both narrow and wide areas. The Troax Medium is compatible with Troax UX550 and Troax UR350. 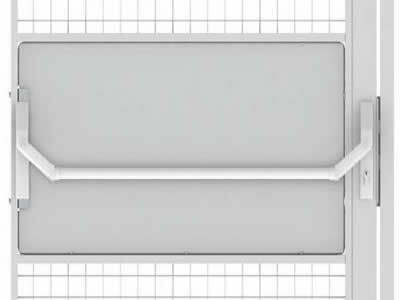 The UX 450 mesh panels are compatible with the Troax Medium system with a UX 450 door included. 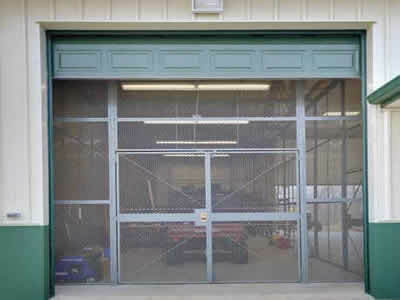 The doors should be used in areas with a strong exterior protection. The door can defend against theft and break-ins because of the padlock door and the padlock made specifically for it. 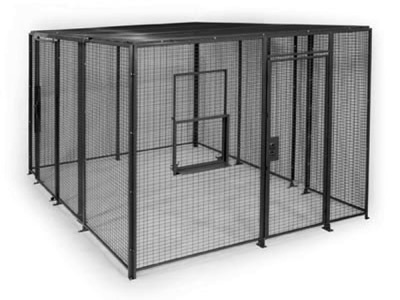 The frame is made of steel tubing that is 1.2x0.8 in and has two cross tubing to make it stronger and secure. The doors are delivered assembled and are ready to be installed. It has no threshold which makes it easily accessible for handicapped and individuals in wheelchairs. 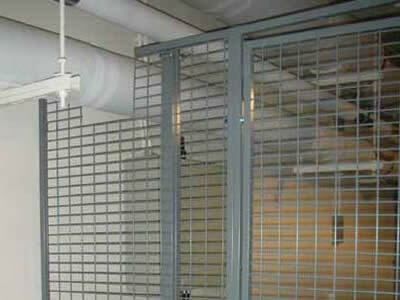 The Troax Safe system UX550 door was specifically made to be used with the UX 550 mesh panels. The UX550 door has been approved by the Swedish Theft Prevention Association (SSF) and the door should be used in areas where an extra high level of security is desired. The frame is made of steel tubing that is 1.2x0.8 in and has two cross tubing to make it stronger and secure. The Padlock includes a cover that was especially designed to provide extra protection. The Door is 2.0x2.0 in which is the same as the partition panes. The doors are delivered assembled and are ready to be installed. It has no threshold which makes it easily accessible for handicapped and individuals in wheelchairs. 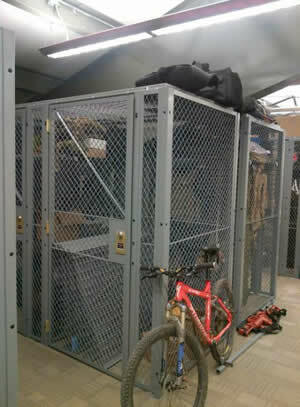 SpaceGuard manufactures Tenant Storage Lockers that are necessary for Military customers and their equipment. 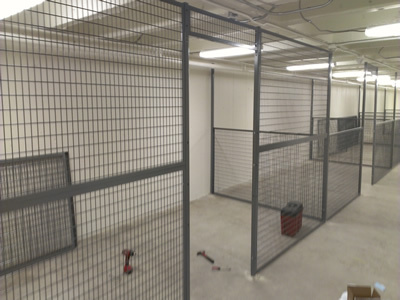 The Tenant Storage Lockers are 10 gauge woven or welded wire. The three standard widths are 3, 4, or 5 inches. Customer may request custom sizes. The Tenant Storage Lockers come with padlock hasp and reversible hinge doors. Built for Military entities such as: Armed Force Reserve Centers, National Guards, Military Bases, and more. Military equipment can be securely enclosed, equipment such as: Weapons, Fatigues, Duffel Bags and other military equipment. SpaceGuard Storage lockers can be installed by anyone. 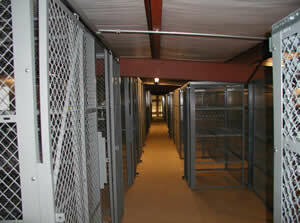 Military Storage Lockers can be customized to meet various requirements. To make the locker truly secure, SpaceGuard has designed door frames mounts and panels to be perfectly even to the floor. One aspect that is often overlooked in receiving warehouse docks, distribution centers, and factories is security access. Most customers come to find it is important to protect their inventory, tools and most importantly, their workers. 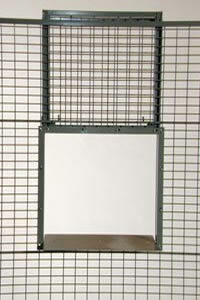 Warehouse Receiving cages are the perfect answer for these potential problems. 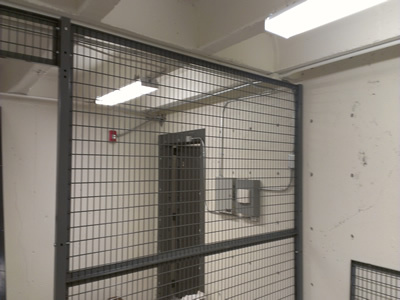 It is ideal to install a Hinged Door Panic Bar on most of your warehouse receiving cages so employees and guests can quickly exit the building in case of an emergency. 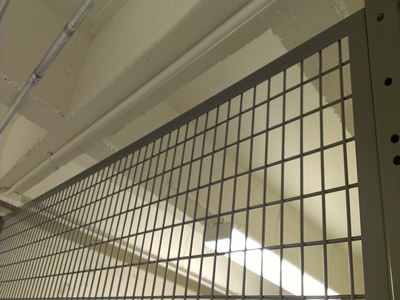 The Panic Bar will allow anyone to leave the premises from the inside without the need to open any locks. Also, it's just more practical for daily use. 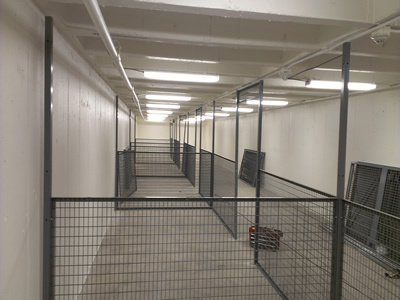 Conclusion: Warehouse Receiving Cages are Great for Receiving Warehouses! 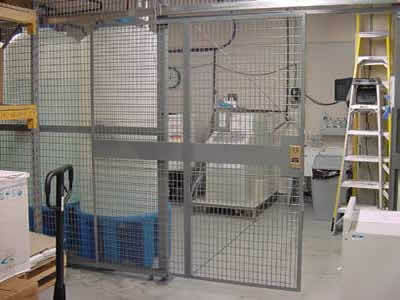 Warehouse Receiving Cages can protect your employees and guests from dangerous machinery. 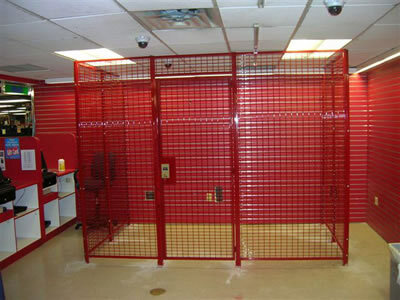 You can protect your warehouse from theft and only allow authorized users access. There are many accessories available, for example, services windows for guests to check in at. Or simply protect your inventory and tools. All panels and doors are shipped with appropriate hardware including heavy duty 5/16" flanged head bolts and nuts for all panel-to-panel, panel-to-door, and panel/door-to-post connections. Floor and wall anchors can also be furnished upon request.